This 50-foot tall, gray gneiss, Gothic-style lighthouse was built in 1872. It is not an official Coast Guard lighthouse, but it was commissioned by the city. The Lighthouse's purpose was to "effectually light" the nearby New York City Insane Asylum for boats navigating the treacherous Hell Gate waters. It was designed by architect James Renwick, Jr., whose other works include Smallpox Hospital and St. Patrick's Cathedral. Inmate labor was probably used in the city-run project, but to elaborate much on its construction is to explore legend. Before the Lighthouse was built, what is now the northern end of the island was only marsh and large rocks. In this 1815 sketch, you can see how exposed the Insane Asylum was and why the Lighthouse was deemed necessary to "effectually light" the building. 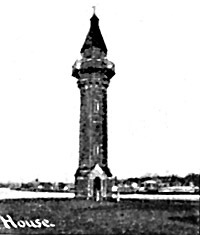 When the city wanted to build the Lighthouse, officials persuaded or bribed McCarthy either to give up or to demolish the fort. Whether McCarthy complied or not is the choice of the storyteller, but the fort did come down. Then supposedly another Asylum patient was summoned to build the Lighthouse. This inmate styled himself "Thomas Maxey, Esq., architect, mason, carpenter, civil engineer, philosopher, and philanthropist." The lighthouse was built, though adherence to Renwick's blueprint is questionable. The Lighthouse, ca. 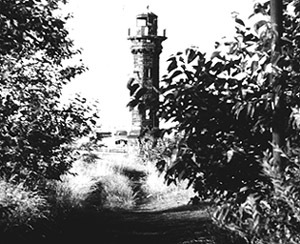 1975, before construction of Lighthouse Park. PRAY FOR HIS SOUL WHEN HE DIES." The Lighthouse was decommissioned in the 1940s, designated a city landmark in 1975, and partially restored the following year. In 1998 an anonymous grant of $120,000 funded complete restoration (including internal lamps).